This was posted 7 years 7 months 19 days ago, and might be an out-dated deal. AFAIK this is the cheapest laptop that you can get that comes with a 2nd gen Intel CPU. "Together with a fast hard drive the application performance is very good for a subnotebook." "Surfing with WLAN 6h 58min"
Just select the base model and enter coupon at cart. The code also works with other laptops, not sure when it expires. Mikinoz on 04/09/2011 - 16:15 Comment score below threshold (-14). The code works buying one for me. AU$389.22 save AU$109.7. I ordered a E520 the other day using the code and so have many others on whirlpool. Really, okay it didnt work for me just now. Maybe its finished or they have fixed it? Okay it worked for me then, didnt work first time. Great Deal for the price! The current deal is now a 500gb external hd, but unfortunately only if you purchase a E520. If you don't mind the size then it's a better deal as it's cheaper after upgrading the E320 to have 4gb ram and bluetooth. It should probably be made clear in the OP it doesn't have an inbuilt optical drive. Great deal on a 13"er. Pretty soon optical drives would be the exception rather than the rule. Especially with the incoming ULV ultrabooks. At 1.856kg this would struggle to be classed as a low weight notebook. The Dell Vostro 3350 13"er is 2kg and has a DVD drive. Of course it's not a contender in terms of price, this is just about the weight. But yeah, with networking and external flash/hdd storage optical data is becoming irrelevant. When HD/BD were competing we were all wondering what the next optical media that would replace them would be… now it seems that there just won't be a next optical media. I haven't used an optical drive since installing windows and some drivers. I rarely use it myself. But it seems like something people would want to know straight up. Hey, I tried to copy the same config as yours but the initial price is $604… how did you get $573.80? A noob question, but what's the difference between the different wifi adapters? As in ThinkPad 1x1 b/g/n and Intel WiFi Link 1000? Any reason for Intel Link 1000 vs the ThinkPad 2x2 a/b/g/n? I don't see why it's not worth spending $5 extra on. Intel chips are better supported on linux as well. Most distros natively support Intel, but need to go through the ndiswrapper etc for Broadcom. Didn't broadcom open source their drivers last year? http://lwn.net/Articles/404248/ I thought it would have being incorporated into most distros by now. Didn't realise that, I haven't had a broadcom chip for a while, so haven't looked lately. After my initial run in with Broadcom on Ubuntu, I stuck to Intel chips. Noo I just paid $700 for a 13" first-gen i5. 13" is a good size I find. Indeed, and being a ThinkPad makes this awesome! Although the Ctrl key isn't in the bottom left corner which I find is a downside. For some reason they've swapped it around with the Fn Key. I'm getting an Asus which can't be too bad. I bought the E520 i5 2410m for $525 down from $660. I chose the thinkpad 2x2 wifi for better coverage. It would not be a good idea to save $7 for the thinkpad 1x1 wifi. The Thinkpad 2x2 reportedly has issues with dropouts. Also, support isn't so good in Linux / *BSD, so if you plan to use Ubuntu, get the Intel card. No optical drive! Who do they think they are, Apple? I bought the E520 i3 using BULK2 two days ago for 467.65. Can I cancel that and order again using this code? I made an order from Lenovo a while ago and got it canceled easily, just send them an email or call them up ASAP. Thanks bentan77. I will send them an email right now. How heavy are these? Shame Lenovo doesn't include this vital information on their site. I'm guessing those weights are with the SSD since it wouldn't be the same weight as a mechnical drive and the notebookcheck review lists the weight as 1.856kg. E420: 2.1kg E520:2.4kg (both with a 6 cell battery). That's from a pdf on their site, but I'm too lazy to find the E520 info. what about the H x W X D ? i have a previous generation of this model with a ulv core2duo in it. i am very happy with it but am considering selling it off to buy this one with a beefier processor. i love the look, feel and performance of this laptop. perfect size and weight, nice keyboard and the price is right. someguy102 posted the same question above, see response there. guess it was double noob question. thanks for pointing me to it. Also ordered base E320 + Intel wifi for my daughter - $393.12. Much better than many of the retail options out there with lesser chips so very good deal as far as I am concerned. The last Thinkpad I had (IBM) lasted nearly 8 years before any probs so hopefully quality is still comparable. Thanks to OP. Yeah you're right. I have sent an email to Lenovo so they can change my order. Hope I'll get that. they cancelled the order, but when I try to get the E520 enhanced, it shows me the Intel HD Card instead of the ATI switchable. Just so you guys are aware if you order that way you don't get the 50% off RAM offer. I purchased a E520 on Friday using the code "BULK2" - brought my notebook down from $660 to $552. Saw this today and the exact same spec laptop is going for 507 with the 500GB external. Called Lenovo and sent them an email, not to happy with this. Not much can be done but still, I'd like to see how well there customer service plays out. Hi MR.LS1, I am in the same boat and just send them an email to cancel my order. If it gets cancelled, would order again tomorrow using this code. I am also in same boat,except I missed it.I bought mine just before the BULK2 deals i.e THINK4DAYS and my order says it is shipped already. Damn frustrating as I would of saved $137 on my order config ! I'm thinking of getting an E320. Wondering whether I should go with the i5 option? Can anyone offer some advice? Would the i5 have similar battery life compared to the i3 option? A more powerful cpu = potential to run the battery down faster. Doing the same things on both machines = same battery life. Thanks mate. That's great! Guess I will go ahead with the i5 option. Cheaper to get the E520 with I-5 standard than get the E320 and pay $175 (holy cow!) to option up to I-5. Yeah but ones 15" and .5kg heavier. Depends if you're after portability or not. Thanks, but I like the E320 as it is portable while still having a HDMI. I want to replace my crappy work laptop with the E320 so I can easily carry it around (ie. home). BTW, the difference isn't $175. I think it comes out to be less than $50. 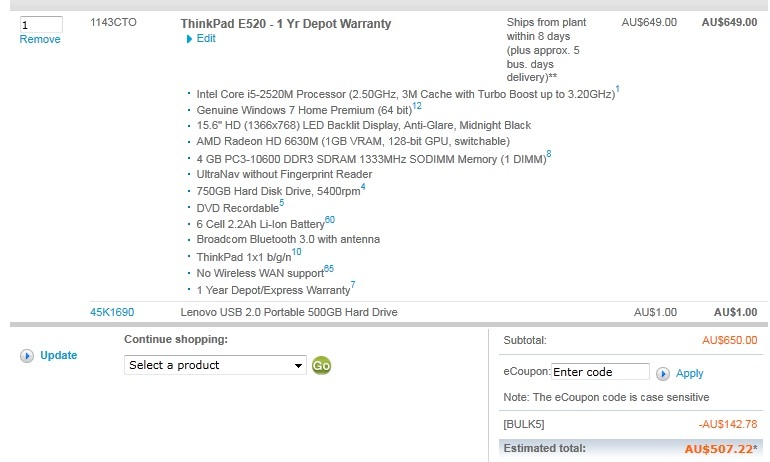 The e320 "Enhanced", which has the i5-2410M as standard, comes to $467.22 with the coupon…so it's an extra $77 or so to go from i3 to i5, and to get +2gb ram (the base model only has 2gb, the Enhanced model comes with 4gb standard). Better value to go with the Enhanced model IMO. Half a kilogram heavier!- oh, my achin' back. My only concern is there are no indicator lights on these Thinkpad Edge models. However it' isn't really such a big deal, HDD indicator lights aren't really needed (you can hear the hard drive going anyway) and when caps lock is on, a floating icon will appear on the screen. Any problem occur with the cart? The price before discount should be $899, but in my cart, it's $739. how did that happen? in my cart the before dicount is 899 and after is 701? OP just put the above deal into his post. Enjoy the bargain guys! Tried to recreate this deal but no luck. Anyone else managed to recreate it again? how do you get money back from Moneybackco???? Do you buy from lenovo first then claim thru Moneybackco? hey anyone know if there's any good deals for a 17" laptop instead? so hard to find good deals on those… I'm looking for a desktop replacement. would 2 dimm would be better for faster trhoughput? but probably the downside is no free slot for future upgrade? Go with a single slot 4GB. An extra 4GB costs almost nothing if bought at a normal store ($29 at MSY for 4GB Kingston lifetime warranty). Is it worth paying $30 extra to upgrade to the 9 cell battery. How much difference would it make in terms of hours of use on a full charge. Add ~50% over 6 cell. In addition the battery also weighs ~50% more. It's physical dimensions are also ~50% more. Also keep in mind that most 9-cells stick out from the case a fair bit, and also add weight. How do you upgrade the battery? Not the cheapest one I have, but the worthiest one. Just bought the E520 Extreme 6630 + USB HDD for $577.42. But I think I have to wait around 3 weeks before delivered. I just ordered 3 of those models but upgraded the wifi so $585.22/each. Best bargain I could find for a lappy so mum, myself and gf are all getting one. And yet (at time of posting), no positive vote? it has windows XP support! If I hadn't just bought my HP DV6 8 months ago I would certainly would of bought the Lenovo 13.3" :D.
A positive vote for me. Very good price, and Lenovo make very good laptops. anyone know where i can find good deals on 17" laptops? not too shabby at all. i'm in! thanks op. went for the i5 e320 with 2x2 wifi. $475.